The Lookstein Center for Jewish Education of the School of Education at Bar-Ilan University works to support and enhance the work of Jewish educators and Jewish educational institutions all over the world in English, Spanish, and Russian languages. The Center focuses its work in the areas of professional development, curriculum development, and ed tech. Programs include Lookstein Virtual Jewish Academy, an online school for middle and high school students; Centro de Estudios Judaicos, online courses in Spanish for university and high school students; online communities which connect and support the work of thousands of Jewish educators from all over the world; Israel curricula and social media based Israel education for elementary and high school students in English and Russian speaking countries; custom designed curriculum development for all Jewish day schools in England; custom designed 21st century teacher training for educators in New York (e.g. 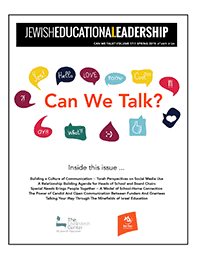 ELAI, Flipped Classroom); custom designed teacher training for Jewish schools in the FSU; the publication of two Jewish education journals (Jewish Educational Leadership, IJJER), and many more.